Chris Hemsworth turned 35-years old over the weekend and received birthday wishes from his superhero friends. 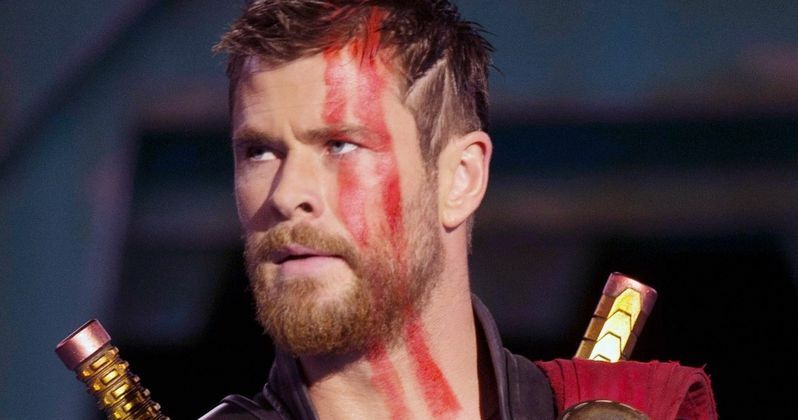 The Thor actor then joked that he had been horribly disfigured by his birthday cake candles, revealing that he is now ready to play Wade Wilson in the next Deadpool movie. Obviously, Ryan Reynolds was not going to let the joke slide, so he fired back stating that he was ready to take on the role of Thor after his eye had been poked out by his daughter. "My son viciously attacked me from behind (due to his ninja training) and slammed my face into the flaming candles, I'll now be playing Deadpool if @VancityReynolds pulls the pin." Ryan Reynolds took note of Chris Hemsworth's joke and decided to one-up him with another zinger aimed at Thor's eye. The God of Thunder now has two eyes thanks to Rocket Racoon in Infinity War, but Reynolds still decided to use the eye as the basis of his joke and then brought up the idea of swapping roles. The actor then wished Hemsworth a happy birthday. Reynolds had this to say. "Weird. My daughter just stabbed me in the right eye. (She's not a ninja, but she is a bit of a d*ck) Point is, We can finally trade roles... (Happy Birthday Bubba!)" While Chris Hemsworth and Ryan Reynolds are obviously joking around about swapping roles, the two will be united under the Disney and Fox merger in the near future. It's unlikely that Deadpool will end up hanging out with the Avengers any time soon, but the idea of them together is pretty amazing. Thinking of Reynolds and Hemsworth working under the direction of Taika Waititi on a possible Thor 4 is almost too much to imagine. Pairing the Merc with a Mouth's potty humor with Thor's quirky humor would be an awesome mix. Ryan Reynolds was not alone in wishing Chris Hemsworth a happy birthday. Wonder Woman star Gal Gadot, Josh Brolin, Chris Pratt, Henry Cavill, and more took time out of their days to wish Hemsworth well on his special day by sending comments to his Wife's Instagram. Brolin filmed a pretty funny video of him singing a song that he apparently made up on the spot while Liam Hemsworth shares a story about throwing a knife at his brother's head. Leon Bridges also sings a happy birthday song. The birthday of Chris Hemsworth ended up as a pretty funny event on social media. You can check out all of the birthday wishes, as well as the role swap below, thanks to Chris Hemsworth's Twitter account.